A big bowl of pasta – who doesn’t love it?! While we made ours with some leftover chicken and chicken stock, you could scramble an egg and toss it with the pasta and vegetable stock, or add some tofu and just pasta water. While the rigatoni cooked, I sautéed some onions and garlic, then in went some frozen corn kernels and the chicken stock and thyme sprigs. When the pasta was just about done I added the broccoli and chicken. Dump the pasta into the sauce and cook it a little more adding pasta water if it needs more liquid. A drizzle of olive oil and some green onions and dinner is done in well under 1/2 hour. 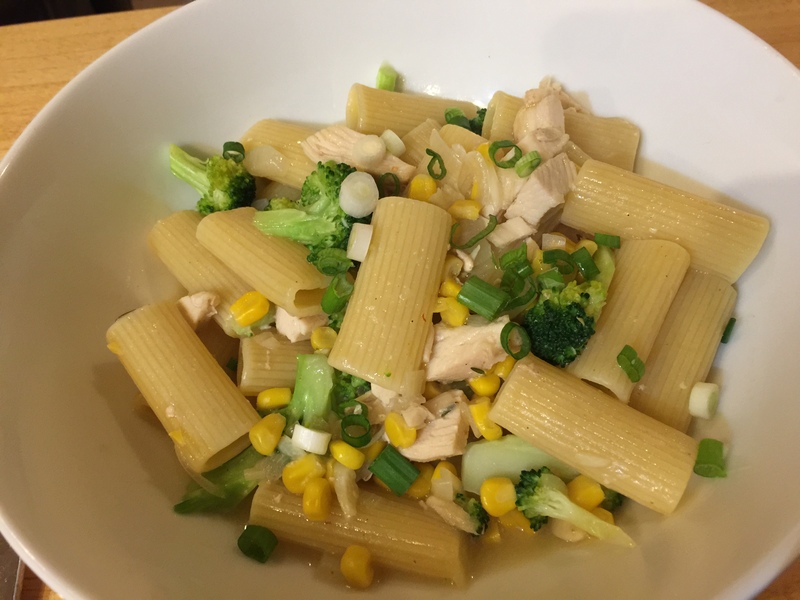 This entry was posted in leftovers, Pasta, Poultry, Vegan, Vegetables, Vegetarian and tagged broccoli, chicken, corn, garlic, green onions, onion, pasta, rigatoni, Vegan, vegetarian. Bookmark the permalink.